Greeting! Are you interested regarding Everest 3 passes trek with Island peak climbing group joining? Or just for Island peak climbing permit and guide sharing? I have (a brother and a sister) clients from Slovakia, they are both fit and a guy trekked with us Manaslu circuit trek couple of years ago. And this time they are arriving on 28 of April and starting on 30th April to Lukla. They are doing 18 days 3 passes trek with Island peak. Only a guy is climbing Island peak. If you are interested please feel free contact us as soon as possible. We are just looking for small group and have a great fun during Himalaya. Hopefully you won’t miss this massive opportunity to explore together and accomplish lifetime memory. The roughly plan has mentioned below. For further detail please contact us! Day-01. Welcome at Airport and transfer to Hotel. Introduce about program then enjoy your first night with food and drinks. Day-04.Phakding to Namche(3440m)(6hrs) Reaching at 3440m Namche Bazaar crossing some long suspension bridges, entering Sagarmatha national park, dense of pine and rhododendron forest and the first beautiful view of Mt. Everest and Kusum Khangkaru will encourage us to end up the last challenging steep part of the trail. It is one of the pleasant days of walking and offer beautiful Tibetan cultural activities, such as Maniwall, prayer wheel, prayer flags, Monasteries, Stupas etc. This is our one of the challenging and amazing day of the trip. Once we arrive at top of the Renjo La, we will greeted by magnificent striking views of beautiful Himalayan vistas surroundings and le an opportunity of celebrating our first success with amazing nature. Then descend to Gokyo. This is one of my favorite places in the planet too. The beautiful Cristal clear lakes at the lap of Himalaya and Gokyo Ri will make our journey unforgettable ever. Early morning hike to Gokyo Ri to explore beautiful sunrise with 360 degree undisturbed towering Himalaya above 8000 m including the massive picture of Everest, Cho oyu, Makalu, Lhotse and numerous snow caved peaks around. According to the trekkers feedback it is one of the most amazing view point of this Khumbu region. Day -09.Gokyo to Dragna (4700m, 3/4 hrs). Today is the shortest day of the trip will leads via amazing glacier and reach in Dragna. It is another massive day of the trek. 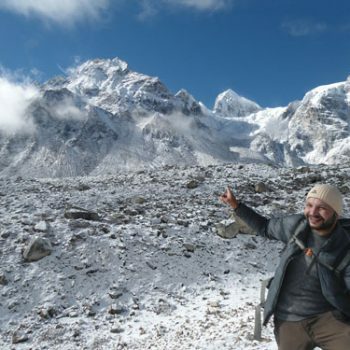 Cho La is quite popular for beautiful view point and adventure pass as well. We will have impressive spectacular view from top of the Cho La. Then we will descend to Dragna for overnight. We will enjoy walking on moraine and heard natural sound of glacier cracking on the way to Gorakshep. After Lunch at Gorakshep we will head to base camp of roof of the world (5364m) and back to Gorakshep for overnight. Day-12. Early morning, couple of hours challenging hike from Gorakshep to Kalapatthar(Black Rock 5550m) might be the most memorable part of the trip and entire life. The spectacular 360 degree massive graceful Himalaya views take you standing at somewhere of natural paradise and returns you the value of your massive effort so far. After capturing the entire beautiful glimpse in our eyes, we will back to Gorakshep and continue to Lobuche. Day-13.Lobuche to Kongma La 5535m then overnight in Chhukung. This is our final challenging and highest pass among 3 of them. After breakfast the trail will ascend gradually to Kongma La Pass where you can have spectacular views of glory Himalaya & Khumbu glacier. Then overnight in Chhukung. Since we do not have tea houses in between Dingboche to Chhukung please make sure you have some snacks and enough drinking water with you. We will also meet our climbing guide right here. Exciting day! Onward we are so close to our final destination. Day-15. Most exciting and crucial day of the entire trip. Early morning hike to all the way to the summit of Island peak (6189m) to make your dream true. The most thrilling and breath taking summit let you life changing experience ever. The invaluable mountain vistas with amazing sunrise stand you not less than natural heaven. Then back to Dingboche. Day 16. Reserve day in case of bad weather. Day 17. Dingboche to Namche(3440m, 7hrs). The trail will continue descend via alternative way Tengboche. It is known as one of the beautiful view point and interesting spot to explore Monastery. Then we still continue descending to Namche Bazaar for back to civilize. Day 18. Namche to Lukla (2840m, 7hrs). After massive achievement of the journey, we will final good bye to Khumbu and back to Kathmandu by scenic flight. Day-21.Transfer to international airport according your flight time.